Pan fried fillet steak served with pommes boulangères, tarragon glazed Chantenay carrots and a red wine sauce. Peel the potatoes and then thinly slice on a mandolin. Peel and finely dice the onions. Heat a large frying pan and then add the olive oil. Add the onions to the pan along with 3 or 4 sprigs of thyme. Sauté for 3 minutes, stirring every once in a while. Add the balsamic vinegar to the pan and continue cooking until all the liquid has evaporated. Mix the onions with the sliced potatoes. Line the base of a large ovenproof dish with the potatoes and onions. Season with salt and pepper and then sprinkle over a few thyme leaves. Bring the stock to the boil and then ladle it over the potatoes. Transfer to the oven and bake uncovered for approximately 45 minutes - check if the potatoes are cooked through using the tip of a sharp knife. While the potatoes are cooking, prepare the rest of the dish. Peel and slice the shallot. Crush the garlic cloves. Place the shallot, garlic and thyme into a sauce pan with the red wine. Bring to the boil, reduce the heat and reduce to 100ml. Add the veal glaze and bring back to the boil. Reduce the sauce to the right consistency and then pass through a fine sieve. Cut the button mushrooms into quarters. Heat a frying pan until hot and add the sunflower oil. Add the mushrooms and cook until golden brown. Season with salt and pepper and keep to one side. In the same frying pan add the bacon lardons and cook until crispy, add the silver skin onions and cook until they are nicely coloured. Mix the onions and lardons with the mushrooms and add all of the garnish to the sauce. 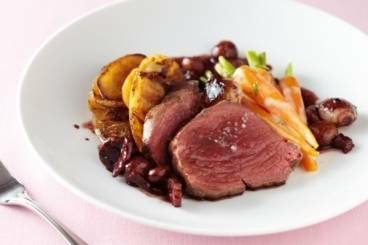 Cook the fillet steak and the carrots to coincide with the pommes boulangères being ready to serve. For the steaks: heat a frying pan until hot and add a little sunflower oil. Season the steaks with Maldon sea salt. Colour both sides of the fillets and then remove them from the pan. Transfer to a baking tray and cook for 5 to 10 minutes in the oven depending on the thickness of the steaks. When the steaks are cooked to the right degree, remove from the oven and allow them to rest for atleast 5 minutes. For the carrots: Trim off the leaves and the stalks. Peel the carrots if necessary. Pick the leaves from the tarragon and roughly chop. Bring a pan of water to the boil and add a generous amount of salt. Cook the carrots for 10 minutes in the rapidly boiling water and then drain. Season with salt, sprinkle over the sugar return to the pan with the butter. Cook over a medium heat until the carrots are glazed with the butter and sugar and then add the chopped tarragon. To serve: Re-heat the sauce with the bourguignonne garnish. Use a stainless steel ring to cut the boulangères potatoes and then place one portion to one side of each plate. Place the steak alongside and then place the carrots on top of the steak. Re-heat the sauce and spoon around the plate.